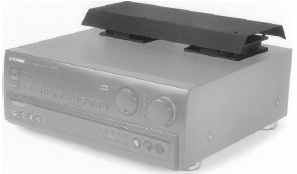 A cooler for use with amps, receivers, surround-sound decoders or any other equipment that runs hotter than it should. Just center it over the heat sinks and plug the wall-type power supply into a switched outlet on your receiver or preamp. The Cool-it will send a quiet stream of room temperature air down the heat sink fins to the power transistors in the amp or receiver, ensuring that they operate many degrees cooler than they would normally. Ideal for amps and receivers which must operate with limited ventilation, such as inside partial enclosures. The single module covers an area approximately 15" by 7"; they're interconnected, and are placed over the hottest part of the product to be cooled. Module contains two 5" fans and thermal switch.